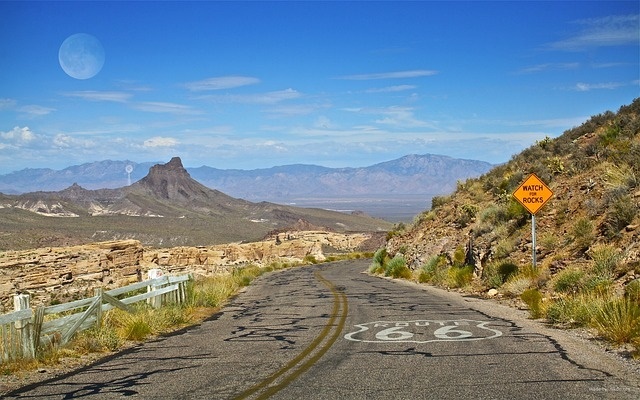 Driving the Great American Road trip along the famous historic Route 66 scenic drive; has featured prominently on many peoples’ Bucket List. 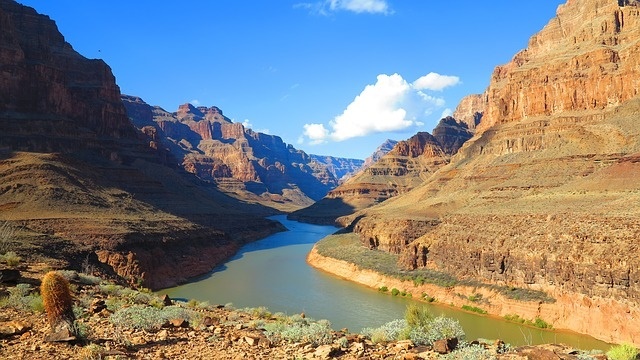 This stretch of iconic American Highway wanders for 2448 miles from Chicago to Los Angeles and is the very epitome of a grand scenic drive by motorhome rental, campervan hire or RV rentals. The original route across America was a thoroughfare for the unemployed seeking to make their fortune in California during the Great Depression of the 30’s; and although much of the original road has been replaced by modern interstate highways. 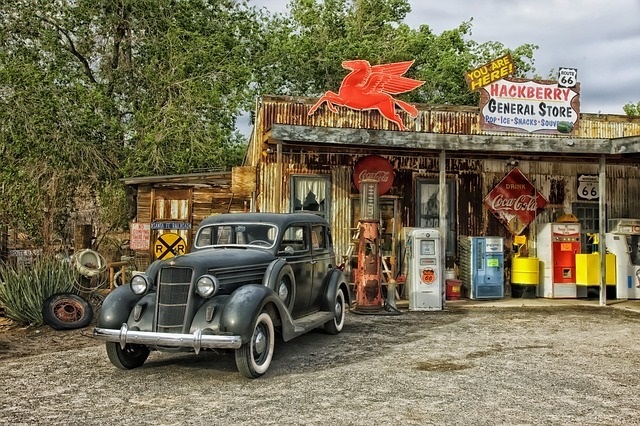 Many of the towns and villages along the route have tenaciously clung to their historic Route 66 scenic drive character, preserving the old neon signs, rusting gas stations and kitschy buildings that will take you back in time over 60 years. Exactly where you go and how long it takes you will depend on how much time you have at your disposal; so as to explore the route and enjoy all there is to see along the way. Here is one suggested 2-week itinerary, which will give you time to see all the highlights. Starting in Chicago, make your way across the Illinois farmland and rolling corn fields to St. Louis (300ml), a good place for your first overnight stop. From here you cross the mighty Mississippi and continue to Springfield where there are plenty of the original Route 66 relics to be seen and you can stop to visit the Crazy Dog drive-in, birthplace of the original corn dog. Stop overnight near Springfield before driving on to Tulsa and Oklahoma City, where a visit to the Oklahoma Route 66 Museum is well worth your while. From Oklahoma the route will take you to Amarillo, Albuquerque, and Santa Fe, which is a good spot to spend a day enjoying the aerial tramway, a hot-air balloon ride or taking a side trip on the Turquoise trail route through the mountains. The next day the highlight of the drive is a visit to the Petrified Forest National Park; with its thousands of acres of petrified trees, en route to Holbrook for another overnight stop; before you drive through Navajo Indian Country to the wonderful Grand Canyon National Park. Here you can stay for several days if the urge takes you; there is plenty to do from hiking through the floor of the Canyon to getting a birds’ eye view from a helicopter tour. When you have thoroughly enjoyed the spectacle that is the Grand Canyon you continue on route 66 to Las Vegas. There are so many attractions to enjoy here; that a few days are the minimum you will need to see the highlights. Enjoy one of the top shows and see if Lady Luck is on your side. Next up is the last leg of the RV rentals road trip through the Mojave Desert to Santa Monica/Los Angeles and the end of famous historic Route 66 scenic drive. All along this nostalgic scenic drive through the heartland of America; you will find good campervan parks to rest after a busy day of driving and sightseeing.